This was originally posted on October 6, 2011. In honor of the 7th Circuit's ruling in Shepard v. Madigan and Moore v. Madigan, I thought it would be useful to repost it. Sometime in the next 180 days or less, the percentage of US citizens in the "red zone" will decrease. This assumes, of course, that the State of Illinois does not appeal this ruling. Now it is up to the citizens of Illinois and their elected representatives as to whether or not they move to the yellow zone or the green zone. Here's hoping for the green zone. I have some of the best readers in the world. One such reader is Rob Vance of California. He works in the software industry and must analyze data on a regular basis. The graphic below is as a result of his sitting down and examining U.S. Census data alongside a state's policy on discrete or concealed carry of firearms. 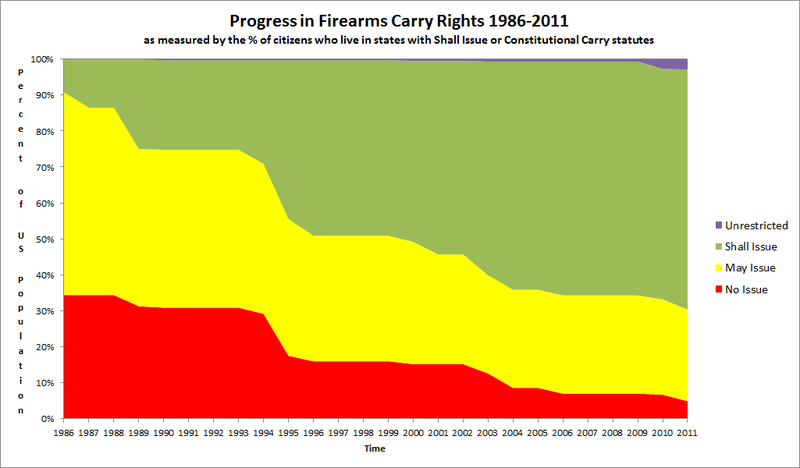 The graph maps the change in the legal status of concealed carry permits by state over time based on data found at www.gun-nuttery.com/rtc.php and the US Census Bureau (percentage of total US population by state). Classification of carry rights status was divided into four groups 1) Unrestricted 2) Shall issue 3) May issue and 4) No issue. A couple of things about the graph and the supporting data. For population values, I used census data. 1980 -> 2010. The annual values (percent of total population by state) are rolled forward – e.g. 1980 census for years 1980- 1989, and so on. With respect to the rounding error the effect of total error is limited to a couple of tenths of a percent. If you examine the spreadsheet with the data values you will see that a may-issue state like Hawaii is classified as a No-issue state. While you could argue that Hawaii should be listed as may-issue or conversely a state like New Jersey should also be added to the No-issue list, it doesn't change the trends shown. 1) In the early 1980s 90% of Americans lived in states that actively suppressed self-defense rights by severely limiting concealed carry of firearms by citizens. 2) By 2010, 2/3’s of Americans lived in states where law abiding citizens could conceal carry if they met minimal standards, and in some states (4 by 2011) needed NO state permission at all to concealed carry. A total of 41 states are now shall-issue or have unrestricted concealed carry status. 3) Few states moved from no issue to may issue. Rather when states made policy changes, they made the jump from no-issue to shall-issue all at once (again, with a couple of exceptions). 4) 30% of the citizens in the US STILL live under state governments that are hostile to the interests of their citizens in self-defense as measured by access to shall-issue (or unrestricted) concealed carry. 5) We’re down to the hard cases now – states where politicians are deeply invested in denying armed self-defense to otherwise law abiding citizens. California, Illinois and New York are where the population numbers are in terms of resistance to 2nd Amendment rights (and yes, there are a few others like New Jersey, Massachusetts, Hawaii, etc.). If I may add a couple of other things, I'd say that shall-issue is the new norm in 2011 as opposed to no-issue or severely restricted may-issue back in 1986. The other thing I would add is that the experience with shall-issue concealed carry in the early adopting states like Florida paved the way for its adoption elsewhere. That is, people applying for concealed carry licenses are law-abiding citizens who have taken the responsibility seriously. Unlike what the Violence Policy Center would have you believe, the streets are not running with blood nor have they. I would like to thank Rob for taking the time and making the effort to put his together. It is great research and his efforts are much appreciated. zeek, there's no reliable way to make an accurate and objective historical analysis of CA counties. We can, however, do so going forward (and have been working to this end since we started the Carry License Sunshine and Compliance Initiative). Good point Brandon. Also, good work on the Sunshine Initiative. Sacramento County alone is just under a half percent of the US population. Even better graphic would be to examine the violent crime rates in areas as concealed-carry becomes the norm. Dollars to donuts there's a correlation in there looking to be discovered. I unfortunately see an inconsistency. CT is listed as "shall issue", because it is a de-facto shall issue state, but structurally, it is de-jure a "may issue" state. NJ is listed as a "may issue" state based on the structure of its law, but it is in fact a de-facto "won't issue" state, thanks to statewide judicial collusion. If we're going with classifying states by their actual practice, NJ must move to "no issue". Alternately, if we're classifying by their statute structure, CT must move to "may issue". I also recall another state that was structurally "may issue", but "shall issue" in practice, but I can't remember what it was...perhaps Louisiana or Alabama. I'd like to see violent crime statistics superimposed - that should drive the point home! Agreed with harrygrantham486: as I recall from the last time I looked at it, NJ has issued only 1,900 permits to those who essentially fit the Hawaii statutory "may issue" restriction (e.g. those handling a lot of money for businesses). On the other hand the big message here is how much of the nation is now Shall Issue or Constitutional Carry; taking the hard fought right to carry away from 55% of the nation's population will not be easy any time soon, especially given the weighting of licensees towards the older who are also much more reliable voters. "I also recall another state that was structurally "may issue", but "shall issue" in practice, but I can't remember what it was...perhaps Louisiana or Alabama." When the NRA started reporting about this, they listed CT and AL as non-discretionary, and IA as discretionary. Some years later they moved CT and AL and IA to "reasonable discretion". Mean that the law granted discretion, but that in practice it was used sparingly. CT is an odd case - permits can be issued by local units of government, and the law concerning permits by local units of government is discretionary. But permits are also issued by the state, and the permits issued by the state are non-discretionary. Since every citizen of the state has the option of applying for a state permit, I'd call it shall-issue, period. AL's law has a vague "suitable person" clause. Which apparently hasn't been abused, or at least not much or often. IA I do know about, and the NRA's attempt to portray it as "reasonable" was flat out wrong. Issuance was up to the sheriff, and some sheriffs would issue to anyone who qualified, and some wouldn't issue to anyone, period. Which makes it exactly the same as CA. As I noted above, AL's law was clarified in August of 2013. We are effectively shall-issue. Any sheriff that denies has the burden of proof for denial. Gosh, with 41 states we could easily pass a constitutional amendment that allows all people to keep and bear arms... oh wait.... never mind. WOW. That graphic would make a great flag! @Stephen - If the SCOTUS screws up, we may have to. While things have definitely been getting better overall, one problem that's often overlooked is the number of places that are "off-limits" in so many jurisdictions, particularly many that have adopted shall issue policies: restaurants, bars, churches, parks, etc. In contrast, a lot of jurisdictions with long histories of restrictive licensing practices have few if any such limits. If You Are "Better Than This", Why Lie? "Guns Are The New Greece"
And Gun Control Would Have Prevented This How? "Calm Down And Take A Valium"
NRA Calls It A "Victory For Self-Defense"
Is It Time To Bring Back The Guillotine?